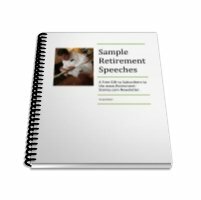 Retirement speeches are an important part of the transition into retirement. A sincere, personal,and often humorous way, of acknowledging the friends and colleagues around you - and the support they have given over the years. When I work with clients on their farewell speeches in my coaching practice, we usually adopt the following guidelines. They are based upon my learning as an "Accomplished Toastmaster" within Toastmasters International, my personal experience of listening to sample speeches, and of writing and delivering my own speech. Your retirement function is an occasion to be cherished and enjoyed (a time to receive tributes and wonderful retirement gifts). Its helpful to remember that you are among friends, and that rarely will you have a more supportive audience. They want you to succeed. You are the star of the show! The content and your delivery should reflect your personality. Humour can give your speech new interest and sparkle, but you should feel under no compulsion to use jokes. It is not essential to an entertaining speech. Dont try it if you are not confident of your ability to use it well. Know your audience. Are you speaking to close work colleagues or to a more general company wide audience? What tone is appropriate to the occasion, formal or informal? Be sincere, avoid exaggerated sentiment. Have a central theme or message - I will miss you, but I'm positive about my future. Be brief, 15 minutes maximum, 5-7 might be sufficient. Tell them about your future plans in a positive and upbeat tone. Wish them and the company well. Know your material - practice and revise. Visualise yourself giving the speech. Realise that people want you to succeed. Concentrate on the message - focus your attention outwards. 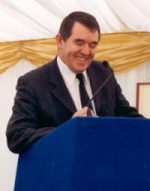 Finally, if you want funny retirement advice read Retirement Never,which won the Toastmasters International speech contest in 1983 - the Retirement Sentiments expressed are timeless! Here you have examples of retirement speeches, when you are the retiree. You may be asked to a speech to honor a retiring co-worker and say a fond farewell. The link in this paragraph has an example of such a speech. You may also be interested in some of the following excellent resources to help you prepare your speech: Speechmastery.com will help you learn the three pillars of great speaking. What you say, how you say it and how you present yourself. It's worthwhile spending quality time getting your farewell words right. I really like these timeless retirement speeches for gracious yet great goodbyes ... they are easily adapted and personalized - find the right words every time!